During an interview on the The Nerdist podcast, Gearbox head honcho let it out that there will be more to come for Borderlands 2 DLC. This isn't really unexpected, due to much of the previous news and announcements from Mr. Pitchford. Many including myself thought there would be plenty more to come. Really, after Tiny Tina's Assault on Dragon Keep, I figure they'd put out some more small stuff while focusing on the creation of the third installment for the next gen consoles- being Borderlands 3. 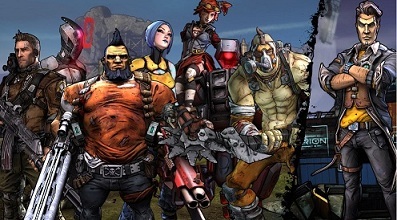 While Gearbox will probably focus the future DLC's on small things like skin packs or weapon packs, I wonder if we'll actually receive any more story DLC. Especially because Pitchford mentions that Gearbox is creating an entirely new IP for the next gen systems in addition to the ones they already own- Brothers in Arms, Duke Nukem, Borderlands, and Homeworld. As for the future of Pandora in the Borderlands saga, I hope we get a DLC that takes place on the Hyperion Moonbase, which the end of Tina's Assault hints at, which would create a nice segway into the potential Borderworlds from the end of the the main story. Regardless, I'll be getting whatever they put out. That, is also what she said.